New route brings year-round flight services between the USA and Greece. Emirates today announced it will launch a new daily service from Dubai to Newark Liberty International Airport, via the Greek capital city of Athens, starting on 12 March 2017. The new route complements Emirates’ existing four daily flights between Dubai and New York’s JFK airport. The United States and Greece have long maintained close economic relations as well as a strong national security alliance. For decades, the United States has advocated policies that promote and foster economic growth and further opportunities for U.S. investment in Greece. The United States is also home to the largest overseas Greek community in the world, numbering approximately 1.3 million, and the New York City metropolitan area has the largest community of Greek Americans in the country. In addition to serving the large Greek-American population in the New York City metropolitan area, the availability of one-stop same-plane service to Dubai will offer a convenient alternative to travellers headed towards the Middle East, West Asia, and Africa. Emirates operates one of the youngest and most modern fleets in the sky, with an average fleet age of just 61 months, compared to the industry average of 140 months. 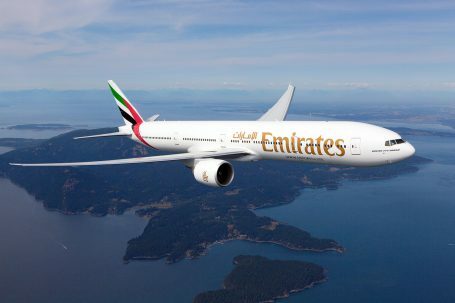 Emirates’ Boeing 777-300ER aircraft serving the new Dubai-Athens-Newark route will offer high levels of comfort and high quality service with private suites in First class, lie-flat seats in Business, and ergonomically designed cabins in Economy. Passengers in all cabin classes can enjoy the friendly service from Emirates’ international cabin crew, meals prepared by gourmet chefs, and over 2,500 channels of the latest movies, TV shows, and music hits on its award-winning ice inflight entertainment system. For flight bookings or more information, visit emirates.com.